The London Underground celebrates its 150 year anniversary in 2013. 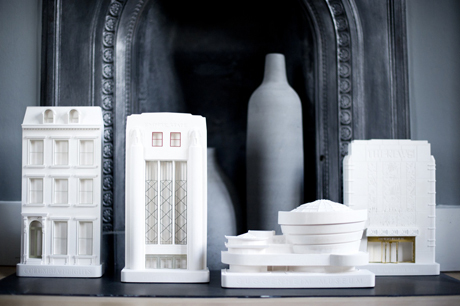 To commemorate this milestone Chisel & Mouse have produced architectural models of their most iconic stations. Chisel & Mouse have recreated a ‘classic’ station from each of the Underground’s three distinct architectural eras in detailed miniature form. From the pioneer period of the late nineteenth century Chisel & Mouse have chosen Charles W. Clark’s long and sleek Farringdon Station to model. They have selected Mornington Crescent Station from the expansion phase of the early twentieth century designed by Leslie Green’s in the ‘Arts and Crafts’ style. Art Deco America meets British Heritage as Chisel & Mouse release phase two of their iconic building collection.